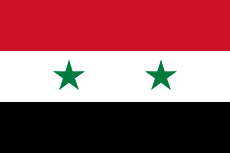 North Syrian Arabic (Arabic: اللهجة السورية الشمالية‎‎ / ALA-LC: al-lahjat as-Sūriyat ash-Shamāliyah) is the variety of Arabic spoken in northern Syria. This dialect is spoken mainly in the region of Aleppo. It is a variant of Levantine Arabic. Lebanon's most northern city of Tripoli also has an accent very similar to that found in Aleppo.